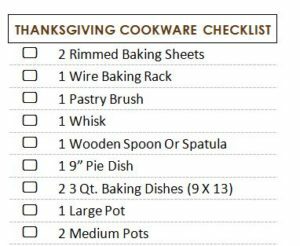 If you’ve never hosted Thanksgiving before and you need to learn the finer points quickly, then the free “Thanksgiving Hosting for the 1st Time” sheet is the best way to get started. This free template document has everything you need to master the holiday season. No one wants to ruin Thanksgiving and this template has all the items you’ll need to make it the best Thanksgiving your friends and family have ever experienced. If you’re ready to impress your holiday guests this year, then read the guide below to learn how to download and use this template. To download the free Thanksgiving Hosting for the 1st Time, scroll to the bottom of the page and follow the link below. The next step is to take a look at the items that are required for cookware and cooking. You need to figure out what you have and what you don’t. This way, you can take the template with you on your shopping trip. The first column of the template if for entering cookware and the second column is specifically for food items. As you check for the items and discover you have them, you can delete the items from the list. To delete something, just highlight the text and press “Backspace.” If you want to add something, start at the end of the last item and press “Enter” to create a new line. To print the sheet, just click the “File” button above and choose “Print” from the drop-down menu. Take your printed fill to the store. When you add the items on your list to your cart, you can make that off your list. This template can bring out the culinary artist in you. You have everything you need to make this a holiday your family will remember for years to come.